Not all Halloween decorations need to be ghoulish. Incorporating a pop of glittery sparkle on your Halloween décor adds a touch of sophistication that all your party guests will appreciate. Every fall-themed party must start with a wide selection of glittered pumpkins, gourds, or squash. Make them the center of your holiday table, tuck them to the side of your doorstep, or arrange them on the hearth. 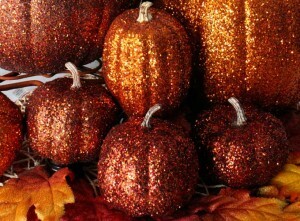 A be-glittered real pumpkin will last through both Halloween and Thanksgiving, while a fake one will last for many seasons. The best part of Halloween is the unexpected. To give your guests a surprise at every turn, consider hanging flying bats or even displaying these spooky witch legs crafted by fabsspiritcentral. 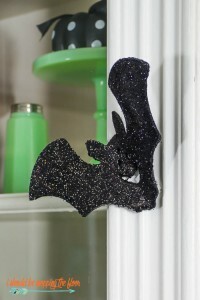 A coating of light reflecting black glitter brings your bats to life as they bob and fly in the breeze and stripes of red glitter give your witch’s stockings their characteristic evil look but with a touch of class. Take the “boo” factor up a notch with scary décor for your table and walls. Black cats, ghost cupcake toppers, and even a witch’s caldron look all that more festive when accented with a touch of glitter. 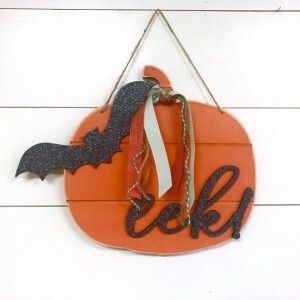 This sparkly pumpkin and bat welcome sign by 302WoodWorks lets your guests know they are in for a good time! Get your Halloween party started with any of these great glittery ideas or design your own glitter creation with real German glass glitter in orange, black, white or try our orange glitter and beads sampler set that gives you a selection of 6 colors and materials. Glitterama Is Back for 2019! Lisa Thompson on German Glass Glitter Give Away! Our World Famous Glitter Bottle Set! Trinity Hall on German Glass Glitter Give Away! Our World Famous Glitter Bottle Set!